Photos of Chinese warship visiting San Diego. – Cool San Diego Sights! 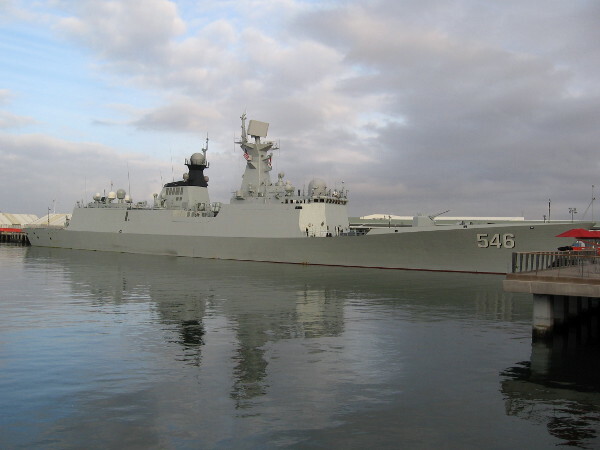 Photos of Chinese warship visiting San Diego. 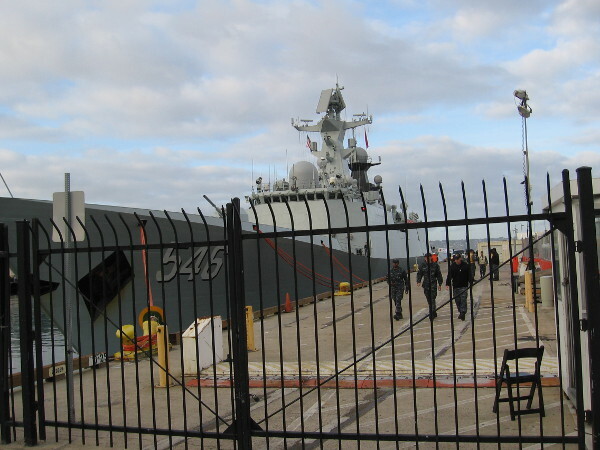 The Chinese frigate Yancheng, docked in San Diego at the Cruise Ship Terminal. It is part of a four day visit by ships of the People’s Liberation Army Navy. This morning I got a few photos of a Chinese Navy warship that will be visiting San Diego for four days. The ship I saw docked at the Cruise Ship Terminal is the frigate Yancheng, which is part of the People’s Liberation Army Navy Surface Force. 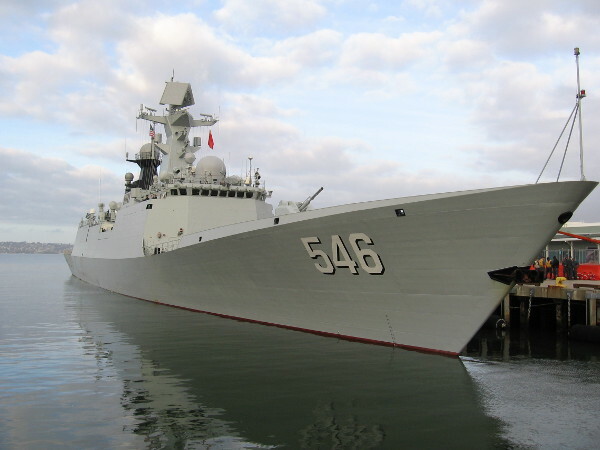 Two additional Chinese Navy ships arrived during the day. I saw them in the darkness after work during an evening walk along the Embarcadero. Those two other ships are the frigate Daqing and the oiler Tai Hu. The intent of the visit is to foster trust and mutual understanding between two military powers–the United States and China. In addition to cultural exchanges, visiting Chinese and local American sailors will enjoy playing games of table tennis and basketball together. In a small, sometimes turbulent world, perhaps it is good to make friendships. United States military personnel walk along the B Street Pier during a visit of the Chinese Navy to San Diego. Another photo of the Chinese frigate Yancheng, docked in San Diego Bay on December 6, 2016. The once-mysterious origin of a U. S. Navy bronze plaque on display in San Diego has come to light. Learn more about this fascinating bit of San Diego and Navy history by checking out my blog post Creating a plaque: Navy history in San Diego revealed! It’s a surprise to me that a Chinese military ship would visit . Great photos . Thanks . I believe it’s the third year in a row. We would see them visit the NEX shopping! Previous Previous post: Sculpture of girl remembers Ellen Browning Scripps. Next Next post: Cool street art and signs in Ocean Beach!